Home » 2018 Anthology Submissions! We want you! 2018 Anthology Submissions! We want you! Share your Words * Share your Story! 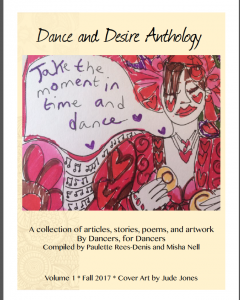 We are now accepting submissions for the 2018 Dance and Desire Anthology from Paulette Rees-Denis and Gypsy Caravan Tribal Bellydance®. Each anthology is lovingly compiled by Paulette and her team to share the community’s perspective on Gypsy Caravan Tribal Bellydance® and the magic that it creates, as well as any style of dance and movement! And now YOU can be a part of this tradition! Last years cover art by Jude Jones! What’s your dance story? How do the movements, music, community, costuming make you feel? And how has the beautiful dance enriched your life and spirit? We’re hunting for some great stories to share with our global community. Whether it’s an article, poem, drawing or photograph, we’d love to share your powerful experiences. This year, we’re asking dancers to describe how dance has shaped their desires and transformed their lives. General guidelines for submission to the anthology can be found below. Did you see last year’s amazing Anthology? Click here for the link! Please submit full, ready-to-publish articles. We will edit as necessary. 500 – 900 words work best. Please include info if your work has been or is going to be published elsewhere. Post should include at least one image that is Creative Commons or owned by you. If you do not own the rights to the photo, please include the source of the photo, and photographers name, so we can double-check the licensing. Please include your (short) bio, a link to your site, and a good quality headshot/photo. Your Gypsy Caravan Tribal Bellydance® experience – Did you attend a workshop, training or take a course and want to share the impact that it’s had on your dancing or your life? We want to hear about it! Love to write about your dance, health, nutrition, wellness? Have an amazing troupe of dancers and want to share what you do? Seen an amazing show that rocked your world, read a book the moved your spirit? Are you a creative entrepreneur and have a suggestion to pass on about stepping up your art and business? Learned something from a teacher or a student or a stranger that is worth telling the world? Used dance, movement, and writing as a healing method for yourself or your clients? Why you dance? Meditate? Believe in a full creative life? Poetry, photographs, essays related to us! Our projected publication date for this year’s Anthology is Christmas 2018! **Just FYI…Paulette loves to guest blog! She has been featured and published in a multitude of international magazines and books. Do you desire a guest post from Paulette and stories about her world of healing, coaching, dance, poetry, or everyday magic? Let’s share and network! Contact us now!